Arsenal fans are obviously delighted with the full return of Lucas Torreira into the first team following a somewhat lengthy absence. The Uruguayan international became eligible to feature in the Premier League after facing sanctions for a sending off earlier in March. A last-minute challenge on Danny Rose earned him a red card which meant a three-match ban for him and even though an appeal was tabled, it did not change the situation as the Football Association declined Arsenal's move. 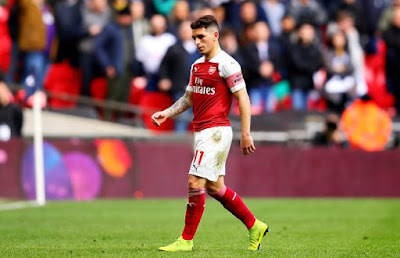 Torreira, as a result of Anthony Taylor's action in the North London derby could not participate against Manchester United, Newcastle United and Everton. His absence was not much noticed until in our last match at Goodison Park where we suffered a 1-0 defeat, thereby reducing our chances to finish in the top-four region. @Arsenal missed him big time in Goodison park. Gunners need you.. Torreria.. last few games defensive midfield has been poor. Hope you bring in more steel. At the right time, thank you! Torreira is in contention for selection when we face Napoli in the first leg of the quarter-final fixture tonight as we hope his experience in the Serie A will be an advantage for us since we will be playing against a side from that same league.